Attractions/Considerations : For those looking for a packed trail, this road, which traverses through pine, spruce, and fir forest, is groomed regularly by an outfitter guide that conducts snowmobile tours to the Tigiwon Community House 6 miles up the road. The Community House was built by the Civilian Conservation Corps (CCC) in the 1930s to accommodate people making the annual pilgrimage to Mount of the Holy Cross and can be reserved through Nova Guides for day use. Access from Vail : Travel west on I-70 to Exit 171 for Minturn, Leadville, and Hwy 24. Exit here and turn right (south) onto Hwy 24. Proceed south about 5 miles to the unmarked Tigiwon Road on the right. The road is immediately before a bridge crossing the Eagle River. Follow this road for approximately ½ mile and park in the marked parking area. 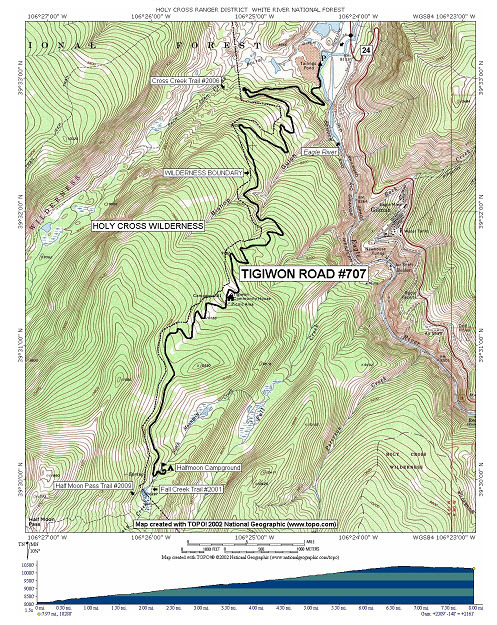 Trail Highlights : The trail follows the Tigiwon Road to Halfmoon campground, Halfmoon trailhead, and Fall Creek trailhead. The grade is gentle in most places. At mile 6, the Tigiwon Community House is reached. From here, outstanding views of the Gore Range and Vail’s Back Bowls are possible. The trail continues for tow more miles to the campground. A popular spot in the summer thus is the trailhead for hikes to Mount of the Holy Cross and Notch Mountain. Eight miles of uphill touring could take all day, so leave early. The return trip should take only a third as long, as one is able to glide smoothly down the road or though the open meadows off the trail.